I was surprised to get a little package from MFT recently (thank you!) – and while it took me a bit to get something done, I’m hoping you’ll like what I have to share! 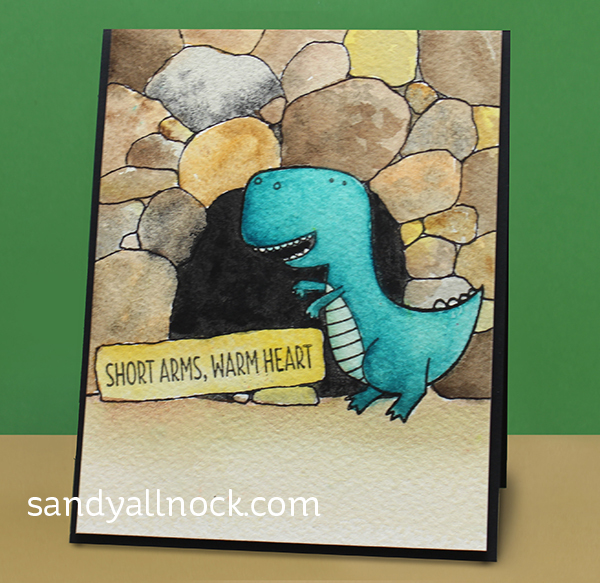 Making scenes is my thing – and making rocks is a pretty easy way to create a scene on your cards. 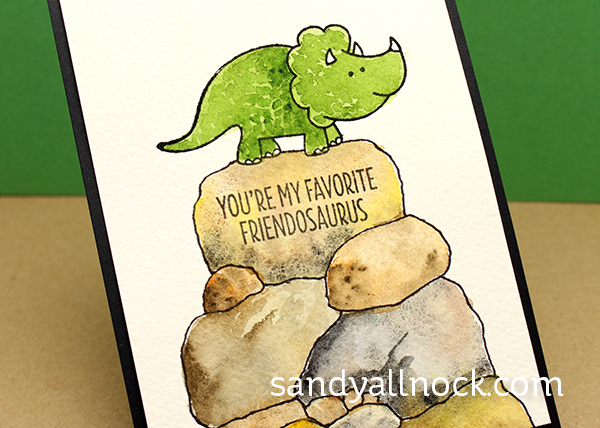 Lots of critter stamps would work with the idea, but the little Rawr-some dinosaurs were perfect for it! Watch the video below or click HERE to see it in HD on YouTube. 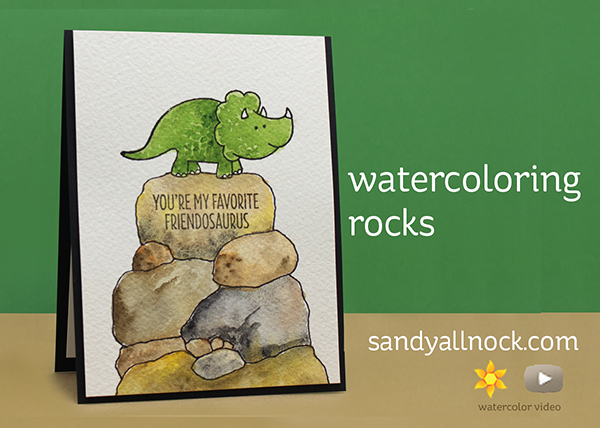 I’m using Daniel Smith Watercolors on this card – but you can use all kinds to achieve this effect. The paper has more of an effect in moving the color over the rough surface than the brand of paint. I also like Gansai Tambi, and the Koi are especially great for travel. 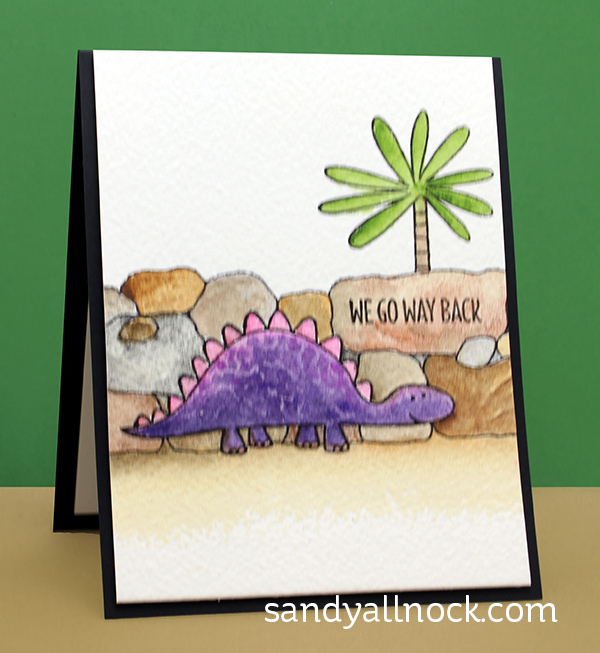 A different rock formation – a rock wall behind the dino, and a tree stamped behind the rocks…. And last but not least, I’ve always felt bad for dinos with tiny arms. So I’m glad they finally have the perfect sentiment! Love your video. Thank you for sharing! Can’t wait to try my hand at painting rocks. Those rocks look awesome! You make it look so easy…can’t wait to try this technique! Thanks for sharing your ideas and techniques! OMG! Love the way you colored all of these!!! Beautiful. Let’s see if I am a allowed to comment today. Thanks for the rocky inspiration that inspired a card I did. Never knew rocks could be so easy. Sandy, These are three dino-mite cards! Too cute! Sandy, these cards are Roarsome! I love the look of the rocks to make a scene. ..so easy to do, but so effective! Love these cards. I think I am going to try making rocks. Like this technique. Great cards, Sandy! Love ’em!!! This is an incredibly creative idea for a background scene that is so versatile! It can be used for far more than just dinosaurs! I can’t wait to try this. You make it look so easy. I hope it will be! Thanks, Sandy! I commented this morning but for some reason it didn’t show up. Hoping this comment goes through. I enjoy your take on this card, and as a vertically challenged person with short arms, I can relate to the T-Rex. I am amazed at your vision on how to quickly draw the rocks! Awesome watercoloring! Love these cards you created with that stamp set. I have that set and now I need to try your inspiration. Such beautiful coloring.